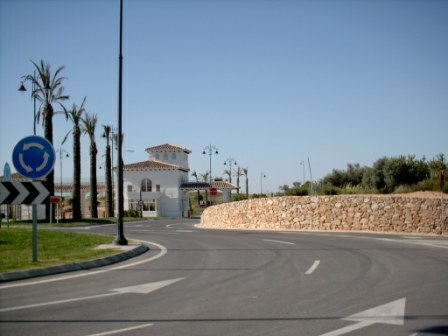 on the private Hacienda Riquelme golf resort overlooking the 16th hole. It offers you the opportunity to enjoy a great atmosphere and tranquillity. from the secured underground garage (and parking space) to all floors of the complex. crammed into ‘as small a space’ as possible, which means peace is guaranteed. please ask as the price varies, depending from which Airport). (extra charge €15 to be paid when meeting). to register their vehicle and address of stay. a few banks with ATMs, some small shops and a weekly (Monday) local produce market. tips and local information from Hacienda. The flat is within easy reach of larger, bustling resorts on the Mar Menor which is part of Costa Calida (or warm coast in Spanish), approx. 250km of beautiful coastline that stretches along the Mediterranean within the Province of Murcia. The region is considerably less developed than the Costa Blanca to the north, and is characterised by small, picturesque, traditionally Spanish seaside towns. The living-room has at one end a 3-seater sofa-bed, an arm-chair and an LCD TV; the big sliding doors opens out onto the balcony with it’s big table and 4 reclining chairs. At the other end of the room, is an extendable dining-table (normally seating 4, there are folding chairs for visitors). The room has air-con and 2 of the wall-sockets are also USB power sockets. The master bedroom has 1 double bed with high quality mattress, two side-tables, a build-in wardrobe, air-con and sliding doors opens onto the balcony. The second bedroom has 2 single beds with the same quality mattresses as the master bedroom, one side-table, a build-in wardrobe and air-con. The communal bathroom has a WC, a handbasin, a shower and a bidet. a microwave, a tall fridge-freezer, coffee-machine, toaster, dish-washer … There is always some coffee and tea, salt, pepper and some herbs & spices in the kitchen cupboard. The landline telephone is located in the kitchen area. You can receive calls (the number is within the travel guide) but you cannot make outgoing calls except to emergency numbers within the resort. has been converted to house a washing machine, a vacuum cleaner and the boiler for hot water and central heating for the cool winter months. but it is permitted on the terrace ONLY. PS. I speak: English, German & Danish. one to the left and one to the right of the building. 4-5 Children’s play area scattered around the resort. so you will not be disturbed by the noise of the pool. Of course, you can always stroll along the golf course walk-ways. 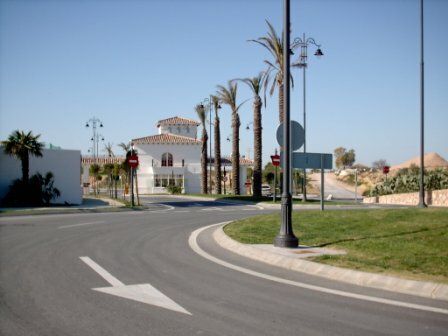 As Hacienda Riquelme is located at the foothills of the mountains, why not drive a 15 km tour up over the mountains towards Murcia use the RM-F56 just outside the complex. The landscape and the mountains are worth it. If it is culture you want, then you could visit Murcia (35km), Catagena (50 Km) or El Castell de Guadalest (165 km). Via AP7 is: 101 km long and takes about 1h 3minutes to drive. This route has 2 pay tolls approx. €4 per toll (you can pay by Credit card). Via A7 is: 87.7 km long and takes about 1h 5minutes to drive. There are no pay tolls on this route; but 13 km on local roads. Via A-30 is: 107 km long and takes about 1h 12minutes to drive. There are no pay tolls on this route; and 17 km on local roads. this route consists mainly of local roads and is always very busy. will revert back to being an air force and rescue base ONLY. 30% deposit required on booking (to be received within one week). if holiday is cancelled less than two weeks before date of booking commences. A refundable breakages deposit of £100 is required (payable by cheque).